Almond, prunes and amaretto encased in a buttery pasty case. 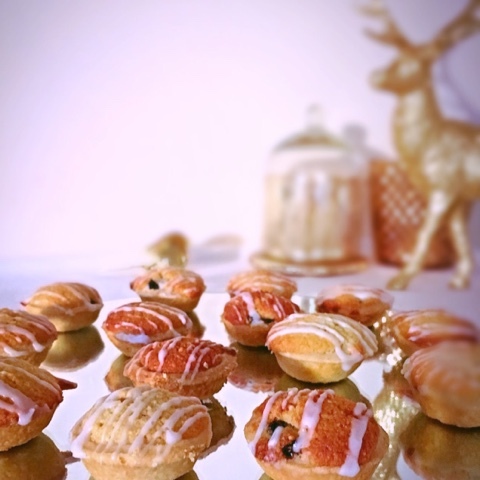 Perfect little petite fours for your NYE celebrations. If you don't have any amaretto almond extract will work in it's place. Blitz together the butter, sugar and flour in a food processor until it resembles bread crumbs, add enough double cream to bring the dough together. Turn out knead into a ball, wrap in clingfilm and chill for 30 minutes. Roll the chilled pastry out into a neat disc with a thickness of about 2mm. Carefully cut out 24 circles using a 2 inch cutter. Line the patty tins, being sure to push the pastry neatly into the corners. Prick the base of the tart shells with a fork. Chill for 20 minutes in the fridge. Mix together the butter, sugar, eggs, flour, cream, almond extract and ground almonds until light and fluffy. Snip the prunes into quarters and divide between the pastry cases, top with the frangipane batter. Bake at 170˚c for about 18-24 mins, until golden and well baked. Leave to cool in the tin for a few minutes then transfer to a wire rack to cool completely. Mix the amaretto with some icing sugar, until you have a thickish but spreadable paste, pour into a sandwich bag, ship off one of the corners and drizzle over the frangipane.